St. Finnian, a native of Leinster in Ireland, was destined to become one of the greatest fathers of the Irish monasticism. His life was compiled in the 10th century. According to the tradition, the future saint was born to a noble family in the second half of the 5th century, most probably in the village of Myshall in the present-day county of Carlow. When his mother was still pregnant, she once saw in a dream that a bright flame flew into her mouth and then flew away like a glorious bird, which at once flew between the northern and southern parts of Ireland, attracting a huge flock of other birds from all over the country, which followed it. The woman told her husband about her vision, and he understood that their child would become a great teacher and mentor. All this later came true. The young St. Finnian was probably educated in Idrone. His first teacher was St. Fortchern of Trim, a disciple of St. Patrick. Some time later, the Saint founded his first three monasteries, which were situated at Rossacurra, Drumfea, and Kilmaglush. 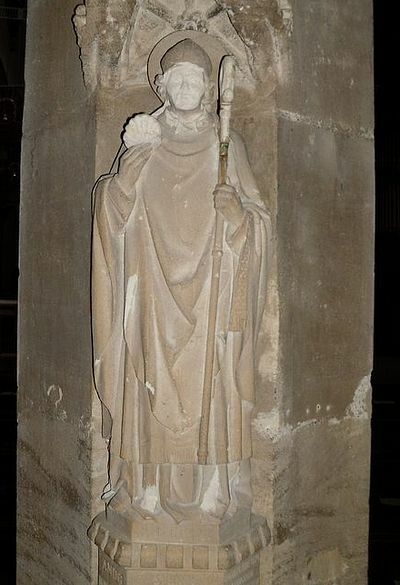 According to some sources, St. Finnian studied for a short time in the great monastic centre of St. Martin in Tours in Gaul. It is certain that this ascetic learned the fundamentals and skills of monastic life in Wales, in the tradition of the great hermits of Egypt. There his teachers included great fathers of the Welsh Church: St. David, St. Gildas the Wise, and, particularly, St. Cadoc. This experience proved to be extremely useful for the saint in the future. St. Finnian meant to go to Rome after his training in Wales, but an angel appeared to him in a vision and told the saint to return to his native Ireland, where he was to become "a teacher and tutor of Irish Saints". Significantly, among the future disciples of St. Finnian was St. Columba, one of the greatest early Irish missionaries. After some 20 or 30 years in Wales, St. Finnian returned to Ireland, where he founded a great number of churches and monasteries, for example, at Aghowle (in Wicklow) and Mugna Sulcain. The holy man liked Aghowle very much and wanted to stay there forever, but the angel appeared to him again and commanded him to go further, as that was the will of God. As was the case with other early Irish saints, St. Finnian became a travelling missionary. 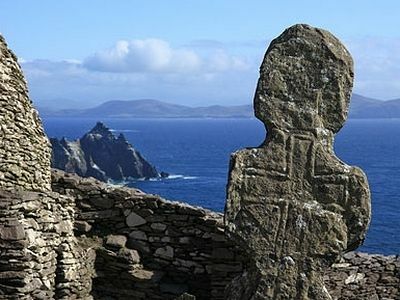 On the island of Skellig Michael, not far from the shores of Kerry, which later became one of the most famous bastions of Irish Orthodoxy, St. Finnian built several churches and founded monastic communities. After that the ascetic visited the monastery of Kildare, under the great Abbess St. Brigid, and remained there for some years. He left Kildare to continue his journeys and finally reached Clonard, situated on the River Boyne in the present-day county of Meath. And the Lord revealed that in this very old and pagan place, where there had never been any churches or monasteries before him, the saint’s main labors were to take place. At Clonard St. Finnian, first of all built a small cell and tiny church, and in the year 520 founded a monastery, which became the largest and the most important in Ireland. St. Finnian became the first abbot of this monastery and organized life there, taking as his model the practices of Welsh monasteries. This form of monasticism was based on the traditions of the holy fathers of the East with the compulsory study of the Holy Scriptures. St. Finnian was venerated as one of the greatest saints of his time. Numerous disciples flocked to him. According to his life there lived some 3000 monks at Clonard at the same time. Monks and laypeople, bishops and priests, poor and rich—everybody came to him for spiritual advice. The fame of St. Finnian, loved and honoured for his exemplary life, learning, gift of prayer and many miracles, spread all over Ireland and far beyond. 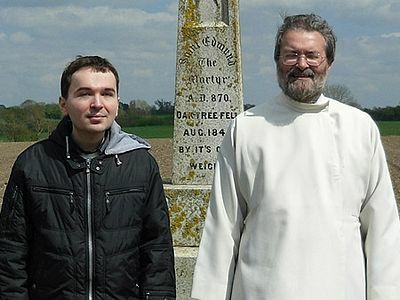 Monks and theologians from various countries visited St. Finnian‘s monastery. Over the centuries thousands of monks there studied the Holy Scriptures, the works of the Church Fathers, grew in monastic life and were then sent as missionaries to distant lands. The rule of Clonard was known for its strictness and asceticism. The brethren slept little and rose early in the morning, prayed frequently and fervently, ate little and worked hard. St. Finnian himself used to sleep on the bare, earthen floor of his primitive cell and never put anything under his head. His iron girdle served him as chains in his ascetic labours. According to the evidence of one of his disciples, the venerable abbot became so emaciated because of his many years of extreme ascetic life that his ribs could easily be seen through his clothes. The disciples of Clonard established hundreds of churches and monasteries in Ireland as well as in other countries. According to a custom which existed in Clonard, every monk who left the monastery as a missionary took with him a copy of the Gospels, a crozier and some holy object (for example, a reliquary) and later, when building his own church or monastery, placed these relics inside it. Thanks to Clonard and other monasteries of similar reputation, Ireland became known as "The Island of Saints". Under the influence of Welsh saints and, originally, St. John Cassian in Gaul, St. Finnian compiled the first Irish Penitentiary, which, in its turn, influenced St. Columbanus, who compiled his own and more famous version. The Abbot also had a reputation as a brilliant interpreter of the Scriptures. St. Finnian died of the plague in 549 (others say in 552). His relics remained in the monastery church at Clonard until 887. There is evidence that after his main relics had been vandalised by barbarians in that year, a small portion of his relics were kept in a parish church near Clonard till the 17th century. The monastery flourished till the 9th century and was considered as the second most important monastery in Ireland after Armagh. Unfortunately, following the attacks of the Vikings from the 9th to the 11th centuries, the glory of this monastery faded. In Clonard today visitors can find a statue of St. Finnian and a church dedicated to him, which contains stained glass of the saint with his disciples. Only minor ruins remain of the former monastery. In the village of Myshall in Carlow, where according to tradition St. Finnian was born, there are ruins of a pre-Norman church, which stood there for many years but was ruined under Cromwell in the 17th century. In the village of Aghowle there are ruins of the ancient monastic church, which was built by St. Finnian himself early in the 6th century. In the 18th century a new church of St. Michael was built near it. An ancient cross of St. Finnian has survived in this village as well. Today there is also a Russian Orthodox mission in Belfast in Northern Ireland dedicated to St. Finnian. It is generally believed that St Patrick brought the Christian Faith to Ireland, his traditional title being Apostle of the Irish. Without wishing to diminish St Patrick’s importance in any way, it is relevant to point out that in 431 St Palladius was sent to Ireland by St Celestine I Pope of Rome, as the first bishop of the Emerald Isle, with the task of administering the sacraments ‘to the Irish who professed Christ’. There must therefore have been numbers of Christians in Ireland by the time St Patrick arrived in the following year.